Our friend the humble mouse has been around for longer than many people think. In fact, it turns 43 this year. During this time we've seen many incarnations of the little rodent; from the ball-based opto-mechanical mouses to early and late model all-optical designs. 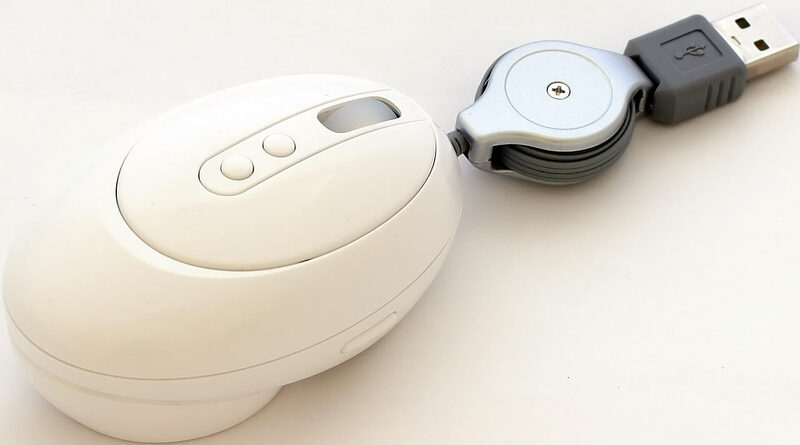 (There are, of course, a few also-rans like the twin-wheel Honeywell mouse - though that actually worked very well, and was an improvement of the design used in the first mouses). Technology grinds on, of course, and new variations on successful themes arrive all the time. Hence, our two candidates today. The first is the so-called Glassing Mouse, made by Globlink, and the second is the Cyber Snipa Intelliscope Laser Gaming Mouse (to use its inflated full name). At base, these are both optical mouses (or mice, if that floats your boat - the debate continues), but they each have a little twist or two. First, the little white Glassing Mouse, yours (if you live in Australia) for less than 25 Aussie bucks delivered from Aus PC Market. Modern optical mouses are of course freed from that tyrannical requirement known as the special dotted pad. They instead have a little image sensor that constantly monitors the surface under the mouse. When you move the mouse, the image that the sensor sees moves, and by tracking those movements the mouse comes up with X-Y tracking information for the computer. The downside of this system is that if the surface you're using the mouse on is insufficiently textured, the image sensor can't track it. This is often the case with very smooth plastics, and especially with white and opaque surfaces that lack anything for the sensor to see (don't try to use your iBook as a mouse mat). Clear, unscratched glass is the worst case scenario of all - as far as the sensor is concerned, there is nothing there at all. This is not an unreasonable failing. Birds, insects and plenty of people have also failed to notice windows before causing themselves a mischief. Normally though, this doesn't matter much. Most people use a mouse pad anyway, and once you find one that works with your mouse, the problem is solved. However, if you're travelling with a laptop, your mousing surface may vary enormously. It could be anything from a glass tabletop to your thigh (or the thigh of the Swedish backpacker next to you, if you're a particularly lucky or handsome nerd). Lugging a pad around with you is one solution, but that's not always convenient. This is where the Glassing Mouse can come in handy. It's an optical mouse with a ball. The design's quite simple, really. The mouse moves, the ball rolls, and a garden variety optical sensor above it registers the movement, because the ball is textured. Here you can see the little cup that holds the ball, with the sensor at the bottom of the well (or the top, depending on your point of view). 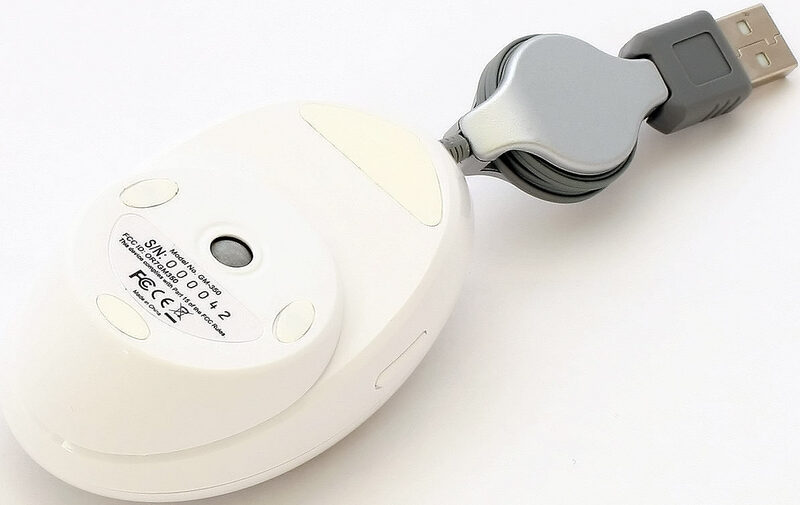 This design is in contrast to older style ball mouses, where the ball rubs against rollers, which turn slotted discs that interrupt light such that sensors can pick up the movement. These rollers also pick up dirt. Anyone who's been computing long enough will have experienced the joy of having to clean the green-grey crud (hair, skin flakes, sweat and sebum, plus a bit of mouse mat thrown in for good measure) out of their mouse. In contrast, the Glassing mouse's ball is completely free standing, and while it will no doubt pick up some dreck over the years, that shouldn't be a problem unless it completely gums up the movement of the ball. That's unlikely, as the ball has a fair bit of free play. The optical sensor will happily register the movement of a dreck-covered ball just as well as a clean one, provided the gunk hasn't managed to clog the sensor's lens. The Glassing Mouse, thus, gets its odd name because you can use it on glass, and not because you can be a sociopathic Begbie-esque moron with it. The Glassing Mouse is clearly designed for portability. The cord has one of those double-winding retraction mechanisms (which generally keep working for quite a while as long as you're gentle with them), and it works quite well - one yank on both ends at once to pull it out, and another to retract it, roller-blind style. You get about 70cm (2.3 feet) of cable, which is plenty for most applications. Your money also nets you seven buttons. The usual left-right-middle (the last by clicking the wheel), forward and back buttons on the sides, and two buttons in line with the wheel. One of those does the same thing as Alt-Tab, and the other launches your default Web browser. Globlink seem for some reason to be proud of the fact that there's no way to change the function of these buttons. They're right when they say you don't need a special driver for this mouse, but you don't need a special driver for any mouse if you're using a vaguely modern operating system. You can usually remap the buttons, though, using your standard operating system mouse setup functions and/or a utility that comes with the mouse. Not in this case, though. Fortunately, the side back/forward buttons on the Glassing Mouse are small and firm enough that you shouldn't click them by accident. If you want some other function, though, you're going to have to find a remap utility that works with this mouse, which is more than I could do. Apart from that, the little Glassing Mouse goes does its job just fine. I've never been a fan of tiny weeny mouses, mainly because I have great big paws with long fingers. For this reason, I didn't find the Glassing Mouse exactly a joy to use, but judging by the number of microscopic mouses I saw in hostels while I was travelling last year, the rest of the world copes just fine. 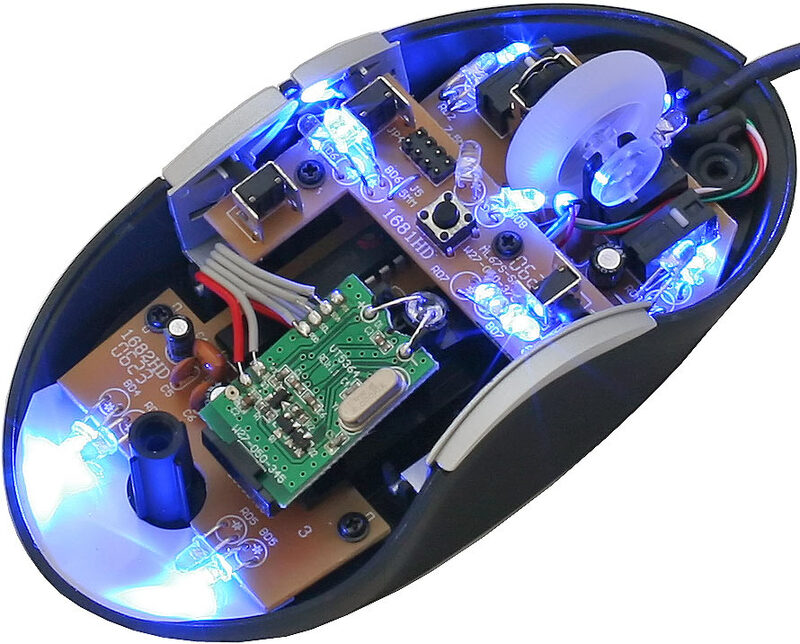 If light and small is what you desire, this mouse certainly fits the bill. It's 85mm long by 50mm wide by 35mm high; not as small as some, but still only about two-thirds the size of Microsoft and Logitech's flagship models. The mouse's internal design is simple yet solid. The build quality is good, and the microswitch buttons have a positive feel to them (a far cry from the v1 Amiga mouse days - there's no sticky tape here!). 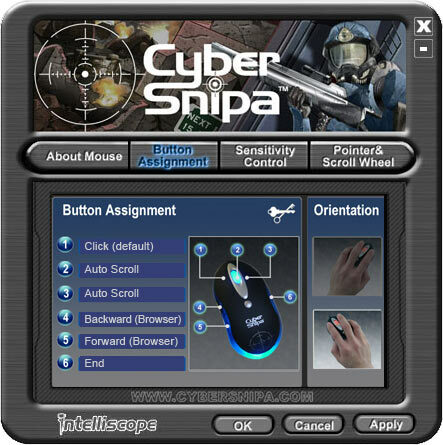 The rated sensitivity of the mouse is "1000cpi". That's "counts per inch", not anything else; it's broadly synonymous with dots per inch. 1000cpi is fairly high, and compared to my bog-standard Intellimouse it made the cursor fly around the screen quite alarmingly until I turned down the sensitivity in Windows. You can also make the mouse less sensitive by holding down the scroll wheel when you plug it in; this puts it in 500cpi mode. Neat, but probably slightly annoying if you want to use it this way all the time. My only real gripe with the Glassing Mouse is that, because of the ball, the mouse's movements aren't always as precise as they could be. I'm being picky though - many people seem able to put up with the Worst Mouse In The World, and then wonder why you pull faces and clench your jaw a lot while you're trying to help them with "their Excel". The Glassing Mouse is a surgical instrument next to those crusty horrors. ...the Cyber Snipa Intelliscope Laser Gaming Mouse (which I shall just call the Intelliscope for the sake of sanity). 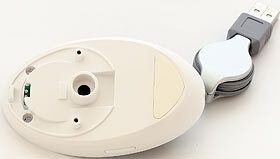 Once again, we have an optical mouse with several buttons. In addition to the standard three-plus-scroll-wheel, there are two side buttons on the left and a single side button on the right. There is also a single button in line with the scroll wheel. More about that in a moment. Apart from having two buttons on one side and one on the other, the mouse's design, like that of the Glassing Mouse, is symmetrical. This is a Good Thing if you're a leftie like me, because it means you can actually use this mouse without cursing about the right-handedness of the world (compare and contrast). As its full name implies, the Intelliscope is equipped with a laser-illuminated optical system, which is capable of 2400 DPI resolution. In other words, it's pretty damn twitchy compared to my MS mouse. The aforementioned button on the top lets you change sensitivity on the fly, switching between 2400 and 1000 DPI. The idea behind this is that you can charge around your FPS world of choice at high speed, and then change to a lower sensitivity for those intimate sniper rifle moments. So that you can tell which mode you're in easily, the Intelliscope lights up blue or red, to indicate the 2400 and 1000 DPI modes respectively. The translucent scroll wheel is also illuminated, and changes colour. Inside, you can see that the Intelliscope is also fairly solidly constructed. The pretty colours come from 3mm LEDs, but they're not dual-colour; there are simply two sets of LEDs, one set blue, one set red. 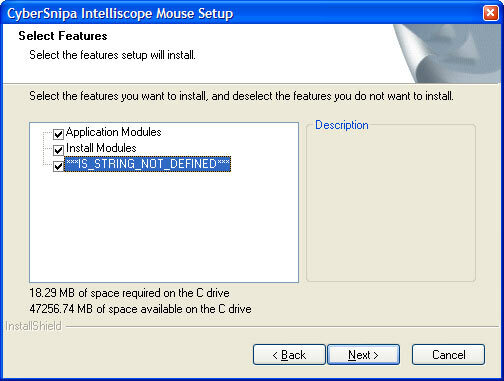 A driver isn't necessary if you just want to use the mouse's basic functions, but if you need to reassign the buttons you'll need to install the supplied software. I'm not sure what that component was supposed to be, but apparently it takes up 250kb, so what the heck, I left it ticked. The software itself has a dinky custom interface, but at least it lets you redefine the various buttons. In addition to various sensitivity settings, and the ridiculous "left handed" mode where the buttons are reversed (does anyone actually ever use this? I mean, apart from for practical jokes), you can also switch on an autofire mode, which simulates continuous clicks. Given that most FPS games have autofire on most weapons anyway, this is a dubiously useful feature, but hey, it's not like it costs you anything extra, and you can leave it switched off. Overall, I found the Intelliscope a nice mouse to use. It has a non-sticky, rubberised coating that will absorb sweat nicely, and it sits well in my hand. It also has a pleasing mass to it, and it feels balanced. There is actually a weight built into the top cover of the mouse, no doubt to help give it this feeling. Your mileage, of course, may vary - mouse comfort is a pretty individual thing, but for someone with bigger hands the Intelliscope will probably fit the bill. 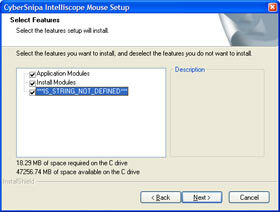 Surprisingly, the Intelliscope is quite fussy about the surface you use it on. My mouse pad, a horrifically overworn and ancient black Everglide, didn't cut the mustard - the Intelliscope was jerky and annoying to use on it. The desk underneath was even worse. 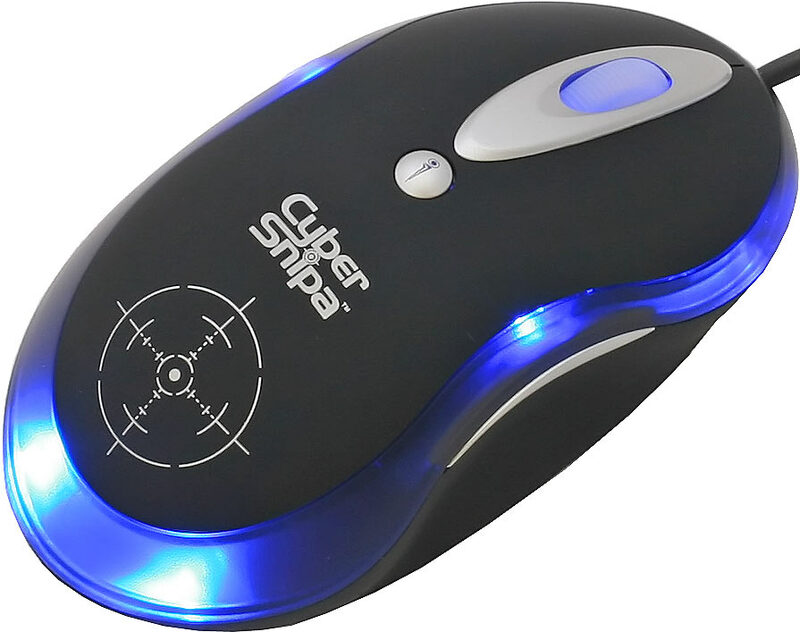 Aus PC Market have also sent me some Cyber Snipa mouse mats, on which the Intelliscope works fine; check out that review here. I must admit that I was quite surprised at how picky the Intelliscope was, but when you think about it, it is a very precise mouse. One doesn't exactly purchase a sports car and then complain about the hard, bumpy suspension. Using a good mouse without a decent pad is similarly silly. Aussies and Kiwis can get the Intelliscope from Aus PC Market, delivered, for $AU76.23. International customers can order direct from the Cyber Snipa site (follow the link to their online shop), or you can use the site to find an international retailer. Both of these mouses fill their niches well. The Glassing Mouse is small, portable, versatile and tough (provided you're not too careless with the retracting cable). It is also cheerfully cheap - a mere $AU21.89 from Aus PC Market, so it just scrapes in under their new free Australian delivery price cut-off. The Intelliscope is a very pleasant mouse to use, suitable for left and right handers, and is well worth the extra few dollars on top of the price of the basic Microsoft offerings. Just make sure you have a decent mat for it. After all, you wouldn't run your Lotus on a set of $70 cheese cutters. Readers from Australia or New Zealand can purchase both of these mice from Aus PC Market. Click here for the $AU21.89 Glassing Mouse. Click here for the $AU76.23 Intelliscope. Globlink's page for their mouses. Or mice. Cyber Snipa's page for the Intelliscope.